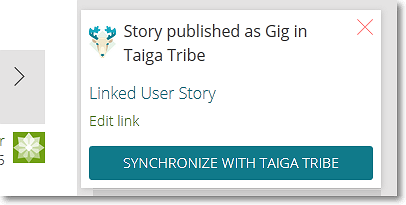 You can publish a User Story on your Taiga project as a gig in Taiga Tribe and hire a gigster to work on that gig; also, any gig that is already created on Taiga Tribe can be managed with a User Story from a Taiga project. To see how you can publish a User Story as a gig, you can go to Publish as gig in Taiga Tribe. After a gig is linked to a User Story, on the details page of that User Story, next to its current status, you will see the Taiga Tribe logo. For any of these actions you need to login on Taiga Tribe. Note: For more details about Taiga Tribe, you can have a look at this article: Taiga Tribe quick overview or access the Taiga Tribe support page.